On a later visit we traced this out and figured out that while it was indeed wired, and was no dummy, the DVR system was on a circuit that was routinely switched off. Apparently they didn't record even when the power was on because there were no tapes. In any event this is a great example of DIY video surveillance, although it is worth pointing out that there are some issues. First, this is technically possible, because many 1990s video cameras featured live view outputs via a built-in jack, and with an AC adapter, they could remain in the powered on state and even resume power on after power loss. Someone figured they could leave the camera in an always on, always broadcasting position. 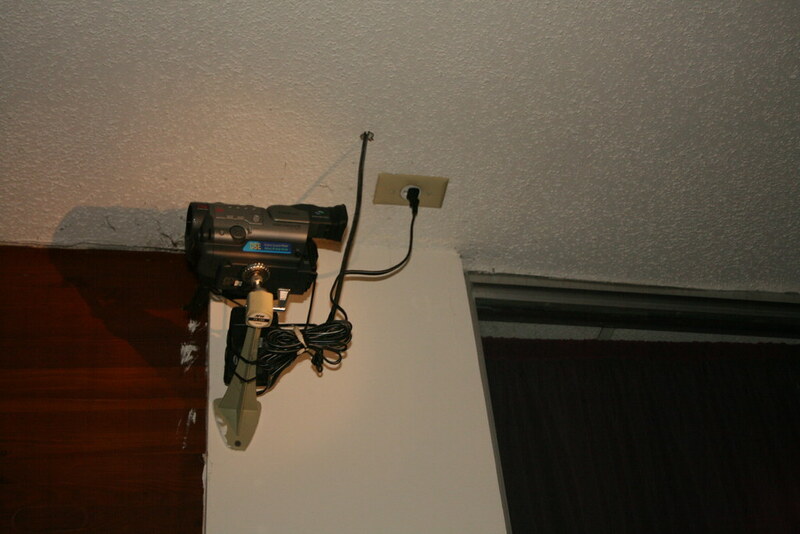 The RCA video output was wired all the way back to the security office, where a multiplexer then fed a DVR (really a VCR, technically). This probably always worked as long as the hotel was open, because really, it was not a high profile target for illegal activity that one would want to surveil. However, this would be really inappropriate in any scenario where a thief would have the opportunity to see the camera before committing a crime. It would be exceptionally easy to reach up, and pull the AC adapter out to disable the camera. Bonus points for using zip ties to secure the AC adapter to the wall bracket.